Two retaining rings, the so-called lower anchoring points, are fitted to each outside seat on the second row of seats. The following table lists where and how ISOFIX child seats can be fastened at the lower anchoring points on the individual seats in the vehicle according to European Directive ECE 16. The body weight permissible for the child seat and the size class A to G are indicated on the label attached to child seats with universal or semi-universal certification. X: Seat not suitable for securing an ISOFIX child seat from this group. IL-SU: Suitable seat for installing an ISOFIX child seat with semi-universal approval, refer to vehicle list from child seat manufacturer. IUF: Suitable seat for installation of an ISOFIX child seat with universal approval and securing with top tether. Observe the instructions by the child seat manufacturer when fitting or removing the child seat . 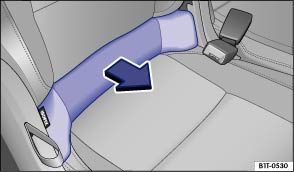 Remove the backrest cushion in the direction of the arrow . Slide the seat back as far as it will go . Lift up the backrest so that it rests against the child seat . Insert the child seat into the retaining rings in the direction of the arrow. The child seat must audibly click securely into place. Pull on both sides of the child seat. Position the child seat on the seat cushion and attach the hooks from the attachment belts onto the retaining rings . Pull the attachment belts making sure they are equally taut. The child seat must fit snugly to the vehicle seat. 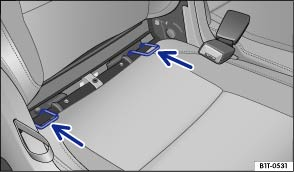 The lower anchoring points for the child seats are not fastening rings. Fit child seats to the lower anchoring points only.